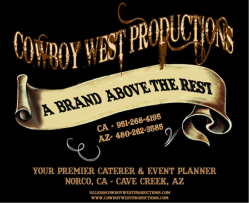 At Cowboy West Productions we believe strongly in community and family. Whenever we can we the Cowboys at Cowboy West Productions give back to our community. Whether it is helping with fundraisers for the serious ill, or giving smiles to the elderly and ill at care centers we are there. We have assisted in events for both the police and fire departments. If you have an special need event give us a call and we can see if we can assist depending on our schedule.